More than any other decorating accent, lighting provides the flourish that makes a room distinct and beautiful. What is a good guideline for spacing and number of recessed lights for a kitchen area? Place the edge of the recessed fixtures approximately 30 inches from the wall. That distance will allow the light to flow over your shoulder and onto the kitchen counter. The fixtures should be placed four to six feet apart. If you have an island or peninsula, the fixtures are best placed directly above the surfaces with the same distance of separation. Keep in mind that the bulbs you use can dramatically change the light output. These dimensions are designed to work based on their location, but the amount of light that you receive will vary depending on the bulb. Want more home lighting tips? Lighting magazine has design ideas as well as information about new advances in light bulbs and the best-kept secrets on how to get the light right. Click here to request a FREE copy of Lighting magazine. For a limited time the ALA is offering Bright Ideas subscribers a complimentary copy of the magazine, which currently sells on newsstands and in bookstores for $6.99. Stop by an ALA-member showroom to pick up a copy of Lighting magazine. A beautifully lit space makes living and entertaining much more enjoyable. To create a well-lit space, light must be layered. This technique allows you to illuminate each feature separately to control the aesthetic focus.?? Layering does more than just provide optimal lighting for reading and conversing. Lighting can draw the eye to the detail in trim work, emphasize cabinet grains or even draw attention to the texture of flooring.?? 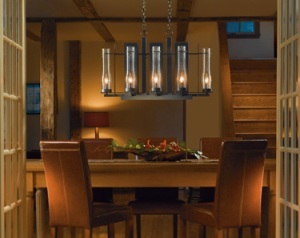 Replace a large chandelier with two smaller ones, each on its own dimmer. Especially in larger spaces, multiple small chandeliers can help break up large ceiling expanses. Rotate shade colors on sconces and chandeliers by the season. It’s a great way to freshen up a space without spending a lot. Add low-voltage lights as accents and spotlights. Repositionable fixtures offer flexibility and control in directing light individually toward chairs and artwork.